It’s not every company or event that needs a radio system for full-time use. When short-term solutions are required, radio rentals and accessories will provide the connectivity and security features your company needs at pricing that’s easy on your budget. We rent two-way radios nationwide. If you need temporary on-site or wide-area communications, two-way radios may be the perfect solution. Rental radios are an excellent choice for trade shows, parades, sporting events and tournaments, movie and stage productions, event and location security and construction; giving your company a big bang for your dollars. Furthermore, our Digital Trunked Radios, under rental contract, can save you money while providing reliable wide-area communications over an area greater than 40,000 sq. miles, and growing; a wise choice for trucking, security, utilities and the petrochemical industry. Today’s law enforcement, fire, EMS, DOT and commercial vehicles are high tech machines outfitted with complex OEM electronics. Equipping your vehicles with new systems requires seasoned professionals and a trustworthy partner that does the job right, the first time. 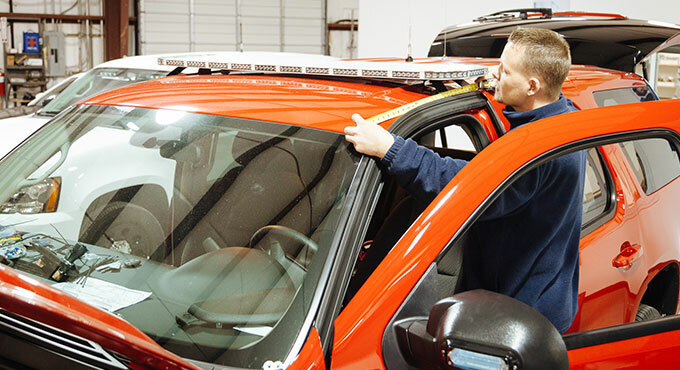 Mobile Communications offers a full service installation department with bays for any size vehicle and, most importantly, installation professionals who are second to none. Whether its radios, radar installation and calibration, comm systems, light bars, push bumpers, GPS devices, cellular boosters, dog boxes, SUV outfits, motorcycles, custom installs and more, Mobile Communications is the professional installer of choice. View some of our installs on YouTube. Mobile Communications provides system design for radio communications and BDA/DAS systems that include needs assessment, site selection, radio propagation studies, and system mapping. Whether you work in public safety, utilities, transportation, healthcare, manufacturing, construction or education, your radio is like an extension of yourself. Outages and equipment failures require a quick response from experienced, technically qualified professionals. That’s why you want to turn to Mobile Communications for your radio systems. We have an in-house service shop with seasoned, experienced repair professionals who can work in shop or in the field. We fix everything from radio antennas to co-axial cable – no job is too big or small! 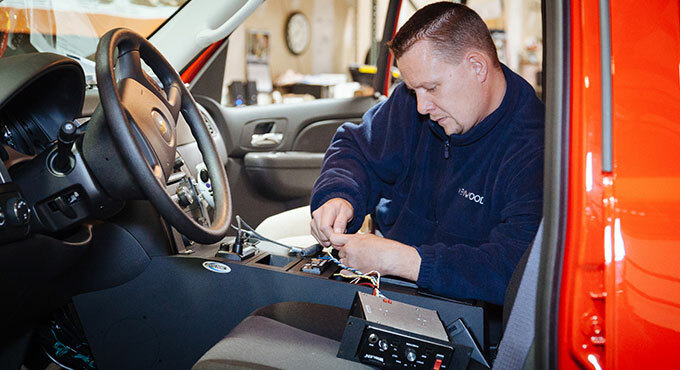 Trust Mobile Communications for all your radio and system repairs. Mobile Communications offers full maintenance programs for all systems that we represent. Regular preventive maintenance by our technical staff minimizes failures and down-time. Additionally, maintenance contracts are available for most communications equipment brands. Mobile Communications’ team members include FCC licensed technicians possessing more than 75 years of combined experience servicing wireless communications equipment, and who have obtained certifications for quality brands like EF Johnson, Kenwood, Motorola, Tait, Catalyst and Bosch Telex and advanced system technologies such as P25, NEXEDGE, TETRA and DMR. Key Skills include but are not restricted to: installation and maintenance, system controls, system schematics/blueprints, RF Diagnostics & Repair, TCP/IP networking, radar certifications, safety and quality assurance, wiring diagrams, testing instruments, RF ID, RF systems propagation studies, coverage maps and P25 infrastructure. © 2014 MOBILE COMMUNICATIONS | 119 Griffith Plaza Dr, Winston Salem, NC 27103 | 336.793.8259 | Website Designed by: Nu expression of Winston-Salem.